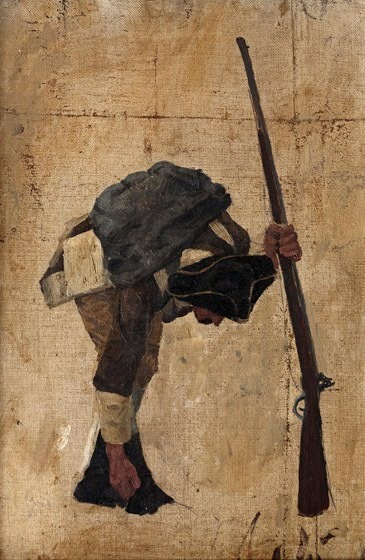 This study is one of four surviving sketches done in preparation for The March to Valley Forge. In the final work, the figure is mostly hidden behind the mounted figure of General Washington, and he no longer has his gun. The sketch was obtained from the estate of the artist by his pupil and protégé, Walter E. Baum. It was inherited by Baum’s son, Robert “Bert” Baum. The current owner purchased the work from Bert Baum. The painting was removed from its stretchers and mounted on artists board by Bert Baum, It is in good condition, but in need of cleaning.